Posted on February 15, 2007	by Linda S.
This entry was posted in Embroidery, Free Patterns, Handcraft, Handwork, Needlework. Bookmark the permalink. I’m sorry, Rita, I do not. I did a search for it and came up with nothing. There are several Yahoo and Google groups concentrating on embroidery… that would be a good place to start asking. (quilthrt@atlanticbb.net) or call and leave a message at 724-246-9076. The “Ladies in Red” patterns by Karen Phillips Shwallon can be found on “Kate and Becca’s Quilt Patch, Etc” web site. Karen designs the patterns and holds class at this show twice a month. Go to http://www.quiltpatchetc.com or call (724) 887-4160 between 10:30am-5:30pm EST and you can see many more of her patterns. I saw some Victorian ladies and birds be Karen Phillips-Swallon, would like to know if you have any of her patterns, or where I can find them, does she have a website or do you have any patterns on your website that I can see? 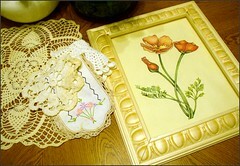 I am interested in buying your patterns for the Flower of the month, all 12 patterns. I bought a Karen Phillips-Swallon Welcom pattern and wondered if there was a color key available. I didn’t take a picture of the sample at the show where I saw it, but it was breath taking and wanted to replicate it. Thanks for your help. For all of you requesting info on Karen Phillips Swallon, here is a url from a crazy quilting site I love.. this is all I know about her. There is an email address at the bottom of the page. I just read this article and I know it is a year later, but I thought I would tell you what I know about Karen. I have been to several of her classes and she lives around the Pittsburgh area. Karen travels to Marietta, Ohio once a month to give classes and I know she travels to other places to give classes. We are working on her Welcome now and it is beautiful when completed. If someone would like her telephone number please e-mail me at roserl@juno.com and I will look the number up for you. I hope I am allowed to put my e-mail address her and I am not breaking any rules.